Assistance of all Muslims is needed in physical arrangements, receiving non-Muslim guests, providing them company during Iftar, giving them tour of the Masjid etc. Brochures on Ramadan are available from IIIE (The Institute of Islamic Information and Education) and can be printed out via their website: www.iiie.net. 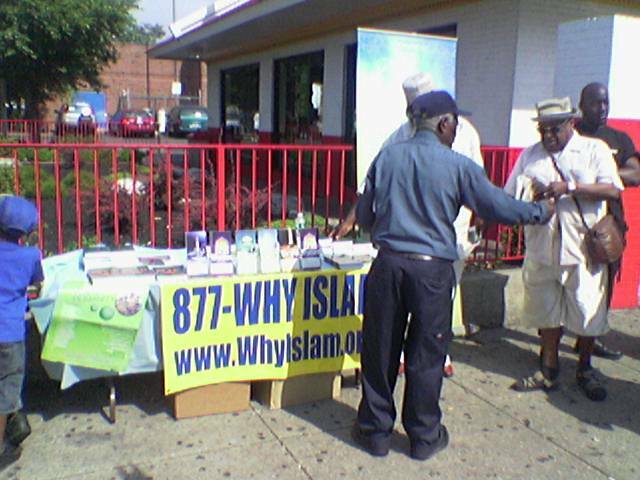 Brochures can also be obtained from ICNA by calling 877-WHY-ISLAM or 1-800-662-ISLAM. This is an age of iPods (100 million iPods sold as of now), CDs & DVDs. Purchase Dawah related media items or burn your own CDs of non-copyright lectures to pass out to non-Muslims. 5. Host dawah booths and tables in Malls, Flea Markets, in front of Masajids and any public place. Libraries are receptive to hosting Islamic items in their main display booth. Alhamdulillah, our public library in Skokie agreed to display Islamic items with just one call and an email. Contact the Public Relations personnel of your public library for such a request. Publication ready Ramadan article is available by contact: sabeeldawah@yahoo.com. 8. Set personal and team goals. Make an intention to arouse the interest in Islam of at least thirty non-Muslims and pass out Quran translations or Islamic brochures to them. May Allah (swt) accept our fasting, expiate our sins and assist us to propagate the message of Islam to non-Muslims...aameen.